Here is an exquisite 15ct gold antique pearl and diamond bangle from the 1890’s that is so elegant and refined and exemplifies high quality Victorian jeweller. 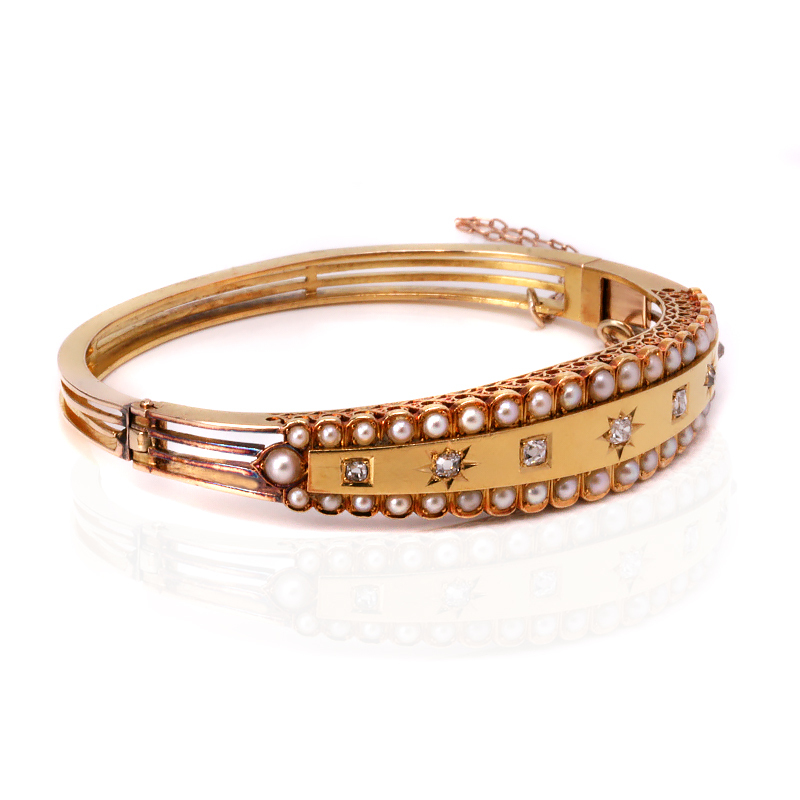 So beautifully made, this bangle was not simply set with natural pearls and diamonds. When you look at the seven antique mine cut diamonds set across the middle, you will notice that not only do they elegantly graduate in size as the bangle gets wider, but the first diamond is set into a square setting and the second in a star design. 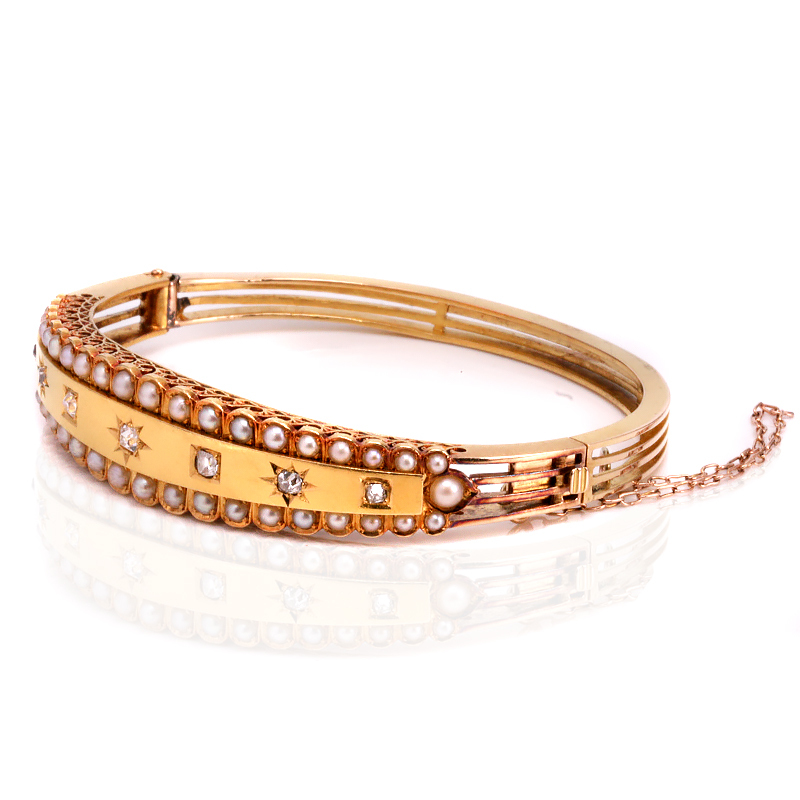 This pattern continues along with all of the diamonds and shows how much extra thought was put into the design of this bangle. With a total diamond weight of 0.48 carats, these mine cut diamonds capture the light so well. And then there are the natural pearls set along each side. Again so much painstaking time and attention has gone into this as the pearls elegantly graduate in size from 2mm in size to 3mm at the centre. This graduation of size is so subtle and compliments the width of the bangle getting wider at the centre. And then there is a 3.5mm pearl set at each end to add to the charm and character. At the centre the bangle measures 12.5mm wide and at the back it tapers down to 4.5mm wide. Being hinged also allows it to sit nice and close to the wrist and the bangle is fitted with a safety chain for added security. When you then look at the bangle from the side, you will see the most beautiful and intricate scroll work detail that again shows how much time and detail was spent on making this truly beautiful bangle well over 100 years ago. This is an exceptional quality antique diamond and pearl bangle that will make any woman so proud to wear this on her wrist for any occasion. Tag: Antique pearl and diamond bangle. Set with antique mine cut diamonds. Antique mine cut diamonds are becoming more and more sought after and where the beginning of the modern round brilliant cut diamond today. Also set with natural pearls that graduate in size, this is such an elegant and beautiful example of an antique pearl and diamond bangle from the Victorian era.